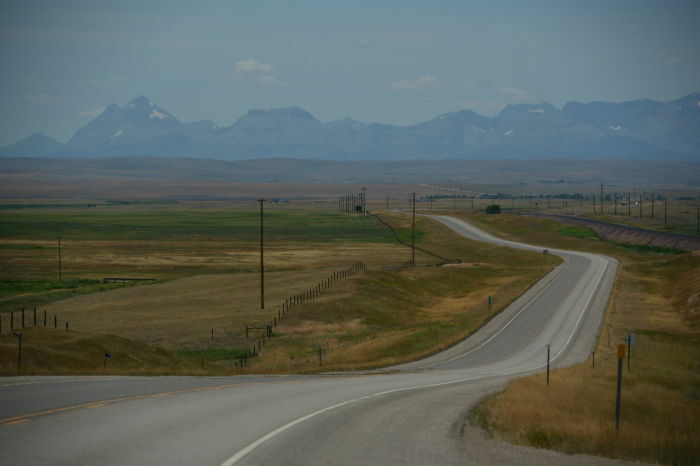 The journey east from the Rockies on US 2 begins with a bit of history, created by some guys who were headed in the same direction. Off the side of the Hi-Line, you might notice a monolithic monument that looks back on the mountains. It was here that Meriwether Lewis reached his northernmost point, made an unfortunate discovery, and named the place Camp Disappointment. 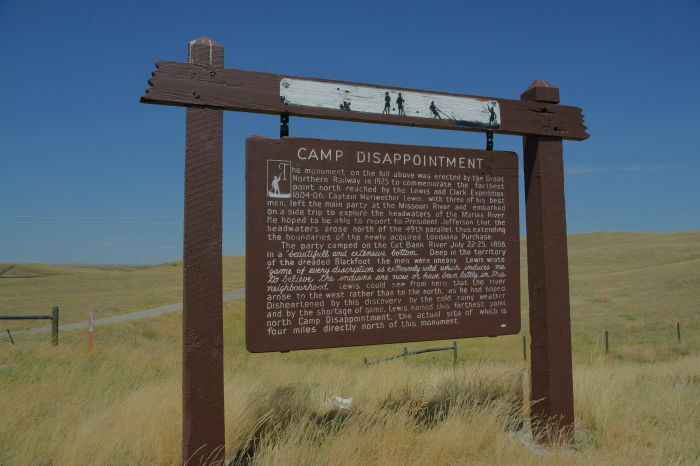 Camp Disappointment is located about 12 miles east of Browning, Montana. Look for a historic marker sign and a dirt road on the north side of US 2. It’s not much to look at, especially now. But this monument stands as a reminder of a low point in the Lewis and Clark expedition of 1806. 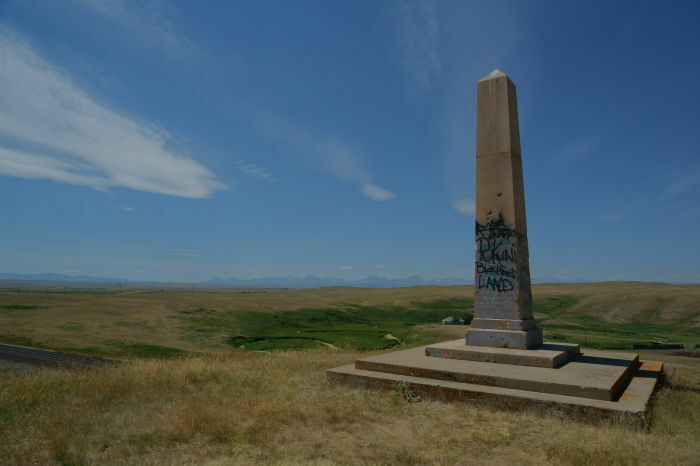 The marker, now covered with graffiti, standing on a bluff littered with trash, marks the northernmost point that Meriwether Lewis reached on that expedition. On the return trip from the west coast, Lewis and a few men had left Clark behind, to explore the Marias River, a tributary of the Missouri River. The farther north that river went, the bigger America would be — because it marked the boundary of the Louisiana Purchase. Lewis had hoped it would reach the 50th parallel, but at this spot, he could see that the river flowed out of the mountains from the west, not the north. That meant the Louisiana Purchase would not reach the 50th parallel, thus the disappointment. But that’s only part of the story. There’s another page of history that helps make the bullet holes and graffiti in the monument more understanding. When Lewis and his men were in the area, they killed two Blackfeet Indians. Lewis’s version of the story claims that the “braves” were trying to steal guns from his party, after a night of friendly gambling and perhaps a foot race. The Blackfeet version (or versions, there are many variations) suggests that the “braves” were mere teenagers, who thought they had won the weapons during the previous night’s gambling. One was shot, the other was stabbed to death. All these years later, those deaths are unforgiven by many in the Blackfeet Nation, and Lewis and Clark are seen as invaders. The actual Camp Disappointment is about four miles north of here, on private land. The railroad erected this monument in 1925. Back on the highway, there’s a historic marker that tells some of the history of this place — the exploring part, but not the killing part. There’s also a beautiful view looking west, towards those same mountains Lewis gazed upon, two hundred years earlier. But I wasn’t headed back to the mountains, I was on a mission to go where tourists generally don’t go: east on the Hi-Line. Next stop, Cut Bank. 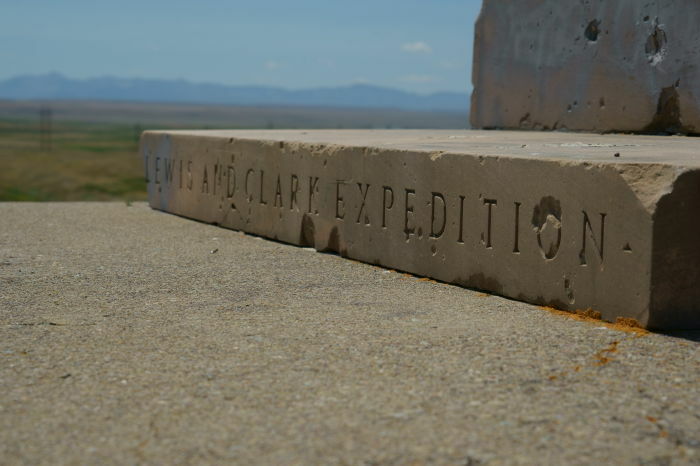 If you have the time, it’s worth the effort to drive out to this heavily-damaged monument to Lewis and Clark. This spot symbolizes the ongoing racial divides affecting Native Americans, as well as the historical significance of the expedition. Plus, it gives you one last (or first) look at those beautiful mountains.